I’ve been in China this week helping the government of Shenzhen with medical education and innovation. Kathy has been in charge of the farm. Before any trip, I do my best to prepare the farm for my departure - maintaining every electrical, plumbing/water, and building issue I can think of. All of the young plants/trees are irrigated, animals fed/watered, and every supply fully stocked. The trails are clear, the fallen limbs bucked up, and the mushrooms harvested. A few of our Shitake varieties fruit in the Spring and we’ve already been gathering our first mushroom harvest of 2015. Our hoop house beds have been bursting with heads of red romaine, winter density lettuce, and spinach. Kathy's been making salads for herself, the poultry, and the alpaca/llama. Even the dogs enjoy a small salad, munching the crisp green leaves while lying under the hay feeder. Kathy's been tending the newly planted squash and pumpkins, as well as readying the heat-loving peppers and eggplant for planting on my return, when the chance of frost will be less. During my absence she’s been preparing more bee hives which she’ll use to create “splits” - dividing mature colonies before they swarm in June. She’s also put up a swarm trap - a container likely to attract bees should one of the hives still decide to swarm. This year we’ll end up with 18 hives - a combination of Russians, Italians, and Carniolan bees. All are gentle, busily gathering pollen and raising brood. "Bees see different colors than humans, and are notably able to see in the ultraviolet range. The color of the hives boxes serve three purposes. One is simple fun aesthetics. More importantly, the dark colors used on the brood boxes in the center of the stack are to warm the hive in the winter by absorbing the heat of the sun more efficiently. We follow the successful experiences of Overland Honey of Portland Maine in the use of darker colors in northern beekeeping practice. 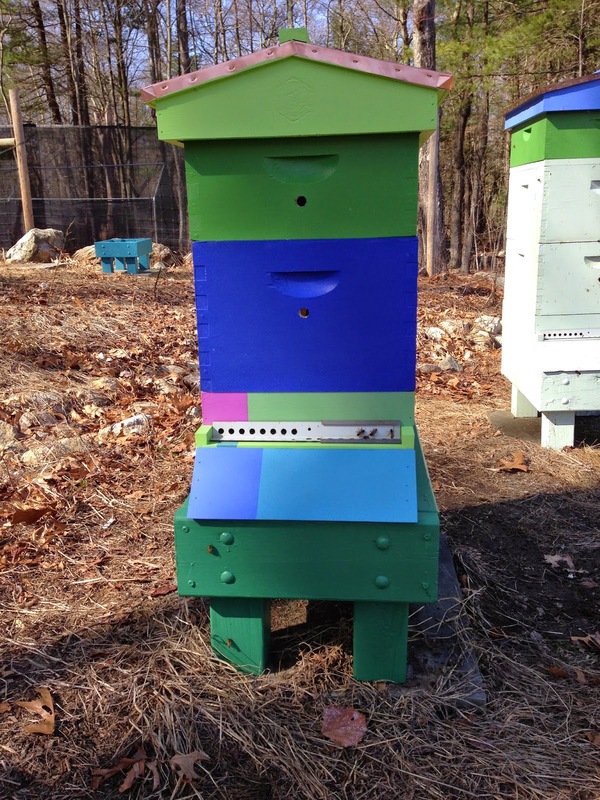 The third use of color on the hives is to reduce drift from hive to hive by the foragers. By creating unique color patterns especially at the landing board, we hope to increase bees accuracy at returning to the correct home hive." I return to Boston tomorrow and will spend the weekend catching up on all I missed. Not only does Kathy miss me, but the Great Pyrenees are waiting for one of their mile long runs around the farm in search of turkey, deer, and chattering red squirrels (chickaree). The first part of this week I have been in China - Shenzhen, Shanghai, and Suzhou as part of a Harvard Medical School program to help the Chinese create a learning healthcare system while they build 1000 new hospitals and train 300,000 new primary care givers. Ajay Singh, Tom Tsai, Li Zhou and I served as faculty for the two day course, reviewing best practices in safety, quality, informatics and leadership. My role was to describe the benefits of informatics, the characteristics of a highly usable EHR, and to predict the future of big data/analytics, mobile, and cloud computing in a way that provided the Chinese with inspiration as they plan their investments. We had dinner with the vice Mayor of Shenzhen and several public health leaders. Then the Mayor of Shenzhen, Qin Xu, officially launched the Harvard-Shenzhen collaborative in front of 200 government, academic, and industry experts. Every time I visit China, I learn a bit more about their healthcare system. Like the US, China is a mixture of rural and urban healthcare settings with different resources, facilities, and people. China wants to encourage innovations such as implementing decision support, creating standardized care plans, and accelerating the use of telemedicine. We discussed that technology is not sufficient - it must be complemented with enabling policy and an urgency to improve the healthcare system. On Wednesday afternoon (local time) I toured hospitals and studied their EHRs. As in the US, there are a large number of EHR vendors in China. Unlike the US, there is no Epic, Cerner or Meditech - hospitals tend to adopt solutions created by local vendors. My hope is that Harvard can share healthcare IT experiences from throughout the world, both good and bad, to help make a difference in the lives of 1.3 billion Chinese people. China will soon be the largest economy in the world, with the largest population, and unprecedented demand for healthcare services. Although I work to improve the healthcare of the US every day, sharing lessons learned with other countries and helping them achieve their goals with greater speed and less cost, is very gratifying. I'm back in Boston on Friday and then in Eastern Europe for a few days in early May. My travel for the rest of the year is minimal, so I can focus on planning the operating and capital budgets of the BIDMC IT empire over the Summer. The April 2015 HITSC meeting focused on the Certification Rule NPRM and a comprehensive review of the Federal Interoperability Roadmap. I suggested that a guiding principle for the committee’s work is to emphasize the enablers in the proposals while reducing those aspects that create substantial burden/slow innovation. As a federal advisory committee our job is to temper regulatory ambition with operational reality. First, Dawn Heisey-Grove provided an overview of Medicaid eligible professionals’ progress towards Meaningful Use. Steve announced the formation of a Standards Advisory Task Force to review the NPRM comments which we will discuss at the May meeting. When then turned our attention to the interoperability roadmap. Dixie Baker and Lisa Gallagher presented the findings of the Transport and Security Standards workgroup. They recommended that ONC partner with the NIST, OCR, and other federal agencies, and industry to enable a uniform approach to enforcing cybersecurity in healthcare. ONC together with OCR, other federal partners, and industry stakeholders should continue to support the National Strategy for Trusted Identities in Cyberspace (NSTIC) program and to draw from existing pilots, where applicable. ONC should support NIST’s effort to update SP 800-63 and to help assure its applicability to and utility for healthcare use cases. ONC should also provide guidance that defines computable, discrete data fields needed for negotiating patient consent and access to health information. Andrew Wiesenthal and Rich Elmore presented the findings of the Content Standards Workgroup. They recommended improved consistency in the implementation of Consolidated CDA through further guidance or constraints, extension of standards to promote exchange across the care continuum, including new sources of patient generated health data, device/sensor, environmental and other big data. They also noted that APIs by themselves will not open up clinical systems for learning, an ecosystem, culture, and policy are important enablers. *CCDA Simplification has occurred between Release 1 and Release 2. Finally David McCallie and Arien Malec presented the findings of the Architecture, Services, and APIs workgroup. They presented a framework for evaluating technology policy surrounding health information technology. I believe their work is foundational to the future thinking about interoperability and could only be proposed now because of the current technologies available to us such as FHIR-based APIs. All reports were approved by consensus for transmission to ONC. 10 members of the Standards Committee will leave the group when their terms expire in June. I will leave the Standards Committee when my term expires in January 2016. It will be fascinating to watch the transition. Will the consensus change when the membership changes? In June we will celebrate the amazing contributions of those who have served for their 6 year term limit. The daytime temperatures are in the 60’s and the evening temperatures are in the 40’s. The heated buckets in the barn can finally be retired. The heated bases for the poultry waterers and stock pond can be unplugged. The chance of frost will continue until late May, but the daily sub-freezing temperatures have passed. The row covers are off the hoop house raised beds. With temps in the 60’s Kathy can finally work the bees, she’s cleaning, feeding, and organizing the hives. She’s preparing for the spring swarming behavior and has readied our “splits” - hives to take on the colonies that are going to swarm. We’ll expand our hives from 12 to 16 and begin a queen breeding program over the next few months. 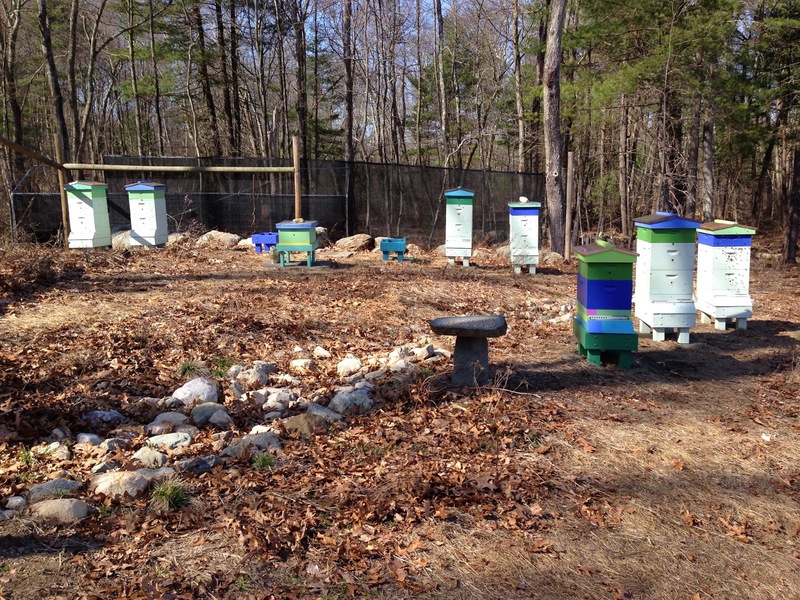 Kathy is mentoring other beekeepers and will be housing a few hives in Wellesley and Holliston as part of achieving diversity and robustness in our bee colonies. She's busy painting hives and I'm building new hive stands. That combination creates a complex flavor, elegant aroma, and satisfying crisp finish. For us, carbonating at 12 pounds per square inch for 10 days at 38 degrees F seems to create the right effervescence. We’re very happy with the 2014 production and now know how to ramp up our efforts. 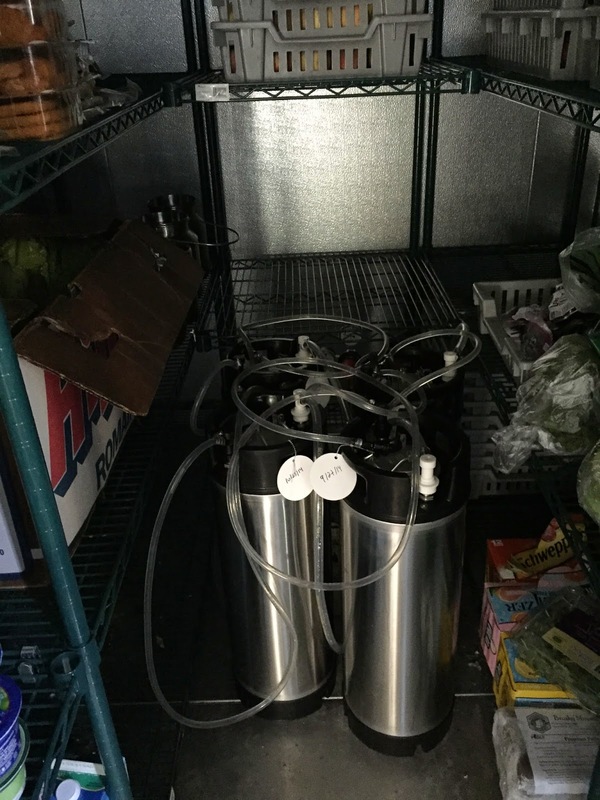 Here's the carbonation setup. Although we’re a federal bonded winery, our state farmer winery license is still in process. Massachusetts not only requires an extensive application backed with numerous reference documents, but it also requires a $3000 Surety bond (which we had to learn how to create - it costs about $250 for 3 years). This weekend, we’ll begin gathering the oak logs for the 2015 Shitake inoculation. 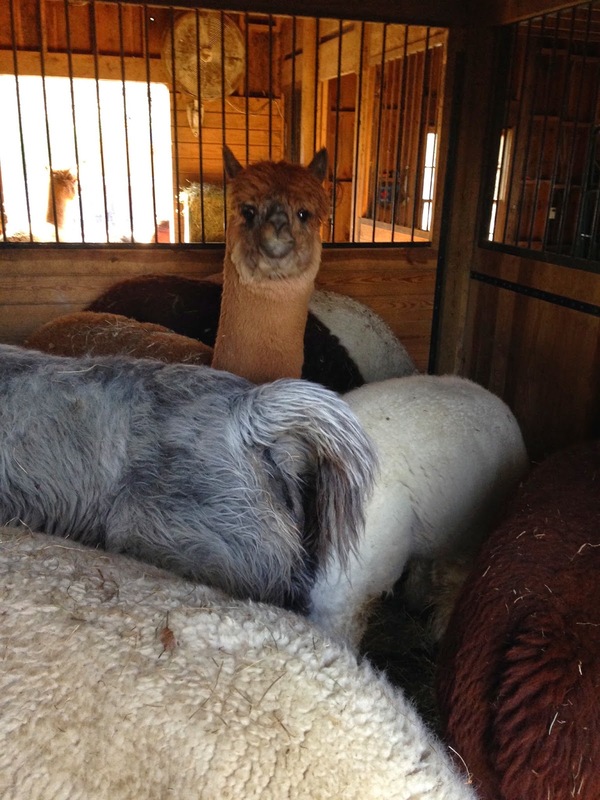 With warmer temps we’ll restart our ivermectin injection program for the alpaca/llama to control meningeal worm. This weekend we’ll be doing toenails and general body exams of all the animals. 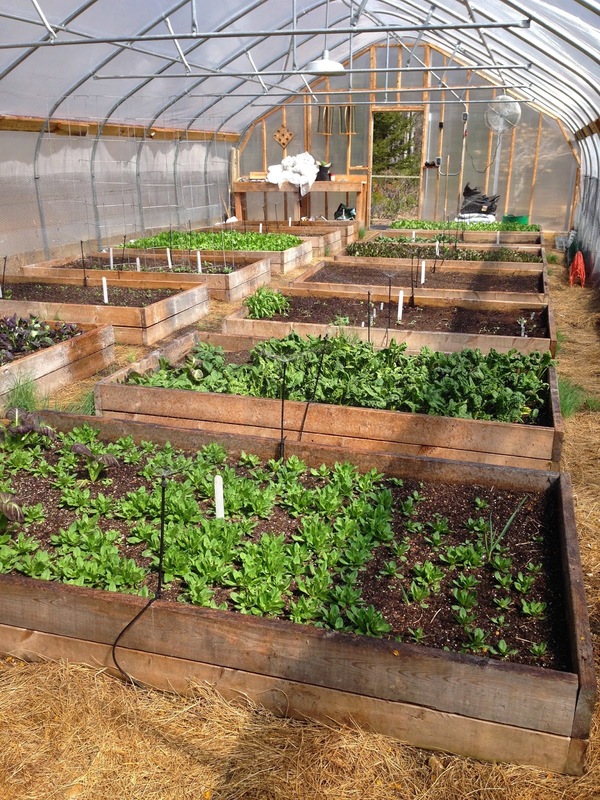 Patriots Day (Monday) is a Massachusetts holiday, so we’ll use the time to plant, harvest winter lettuce, and bottle cider. At the end of April I travel to China for a few days of teaching, so I’m filling every weekend hour with Spring farm duties. It's great to feel the sun on my face and the dirt in my hands. Even the alpaca are smiling. Micky Tripathi sent this update last evening. I’m writing with a quick project update for your information. FHIR DSTU2 Ballot. The effort to keep the Argonaut-relevant components of FHIR on schedule was successful. The FHIR DSTU2 ballot was opened on April 3, 2015. All of the Argonaut-relevant FHIR Resources and associated DAF Profiles are complete and on the ballot. Argonaut Testing and Implementation. Implementation and testing efforts are picking up steam, though with everyone’s immediate focus on preparing for and attending HIMSS, we don’t expect to see intensive testing until after HIMSS, when attention will turn from FHIR DSTU1 demonstrations to Argonaut FHIR DSTU2 implementations. · The Argonaut reference implementation server will be updated after the HIMSS conference to include the full set of Argonaut Resources and Profiles and the first version of the Argonaut OAuth/OIDC security implementation guide. · After the HIMSS conference we will increase our reach out to motivate testing activities by implementation partners, who will at that point be prepared to focus their energies on Argonaut FHIR DSTU2 implementation. The HL7 Ballot for the Argonaut-related FHIR specifications opens today as promised. Here's an overview with a list of the structured data elements to be exchanged through query/retrieve application program interfaces. This approach will usher in a new era of interoperability.